I have been playing around and experimenting for the past couple of months with the Modiva Professional 25mm Curling Iron and have decided to do a review on it. To all my fellow Aussie beauties I think you will be excited to hear, I have stumbled across not only a curling iron which is the same width the whole way through but it's also clipless (extremely hard to find, trust me..I know!) Keep reading to find more about this amazing hair tool and where you can purchase it! It's clipless which means you have to adopt a fairly different method of curling but I find that it's much more simple and is more effective in curling your hair. Now that I have tried clipless I will never use another curling iron with a clip ever again! 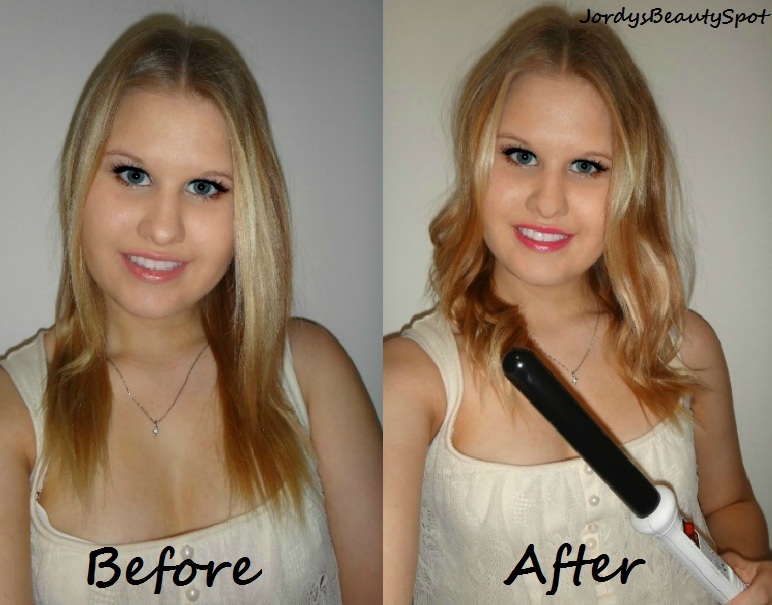 The curling iron that I have been testing out is the 25mm barrel which is the middle option out of the three widths. You can go for a thinner barrel (13mm) for tighter, smaller curls or a thicker barrel (32mm) for looser more wavy curls. I do recommend the 25mm as your first curling iron just because it is so versatile and can create many different styles. For small springy curls you can wrap up smaller sections of hair and tightly, for everyday curls you can wrap medium sized sections around the wand and for big voluminous curls you can wrap larger sections, more loosely. Of course all of these looks are going to take practice to perfect but it's really fun playing around with it and learning all the different styles you can achieve with this one curling iron! The Modiva curling irons heat up as hot as 210°C which cuts out so much styling time because you only have to hold your hair on the barrel for a short amount of time! Of course it will depend of the thickness of your sections and how hard to curl your hair is but I find that I have a whole head of curls in under 15minutes! I also love how long lasting the curls are, they remain perfect all day and still look great the next day which is amazing and super impressive! I love the fact that when you buy your curling iron you also receive little extras that helps curl your hair like two clips for sectioning and a heat protectant glove so you aren't afraid of burning yourself while you curl your hair. This is an Australian website so not only is there no need to convert prices and such but it also means free express shipping! Although it is an Australian based company, it ships internationally! So this curling iron can be shipped to you wherever you live in the world within 5-10 working days! If your from Australia then you will receive it within 1-2 days and that's with free shipping, great deal right! I enjoyed reading this review. Does that company also make other styling tools as well? I already have a curling iron but would like to try one of those crimping iron thingys if you know what I'm talking about. Btw - your hair in your top picture looks gorgeous! Thanks, unfortunately they only sell curling irons and a heat protective mat at the moment. I really want to try one of those crimping iron things as well but might have to search for it somewhere else. Thank you so much! !